Continuing our journey into the more obscure corners of the Gamingsphere, we have another indie release. This time, we’re fleshing out one of video games’ more neglected genres: the Help Tiny Cartoon Dudes Not to Pee on the Floor ’em up. Because that’s totally a thing, mostly courtesy of Men’s Room Mayhem. This arcade title was brought to us by Ripstone. It’s a cheeky little touchscreen affair, akin to the acclaimed Flight Control in its toontastic visuals and control system. Only, here, we’re directing a stream of patrons around the men’s room, and trying to prevent lapses in hygiene/fistfights/puddles of pee on the floor. Yes indeed. 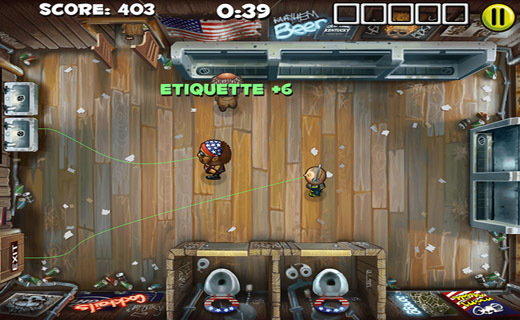 Men’s Room Mayhem consists of a series of… bathrooms, increasingly fancy locations which serve as the game’s levels. You’re presented with a topdown view of your urine-smelling domain, and a fairly strict time limit. ‘Customers’ will enter the bathroom of their own accord, and you must draw a path for them to follow. From the entrance to the urinal/toilet (a charming little icon above their heads will show you which they need) and back to the door, put simply. Etiquette bonuses, handwashing bonuses… they’re all here for the wily player. Naturally, though, there’s more to it than that, which is where that big ol’ MAYHEM in the title comes from. As with Flight Control, you’ll need to manage everybody on the screen at once. Your stylus-flailing skills will have to be top-notch to avoid all of the dangers, as this deceptively simple-looking game has a lot of factors to consider. Firstly, patrons cannot cross paths. This will instantly cause a fight to break out (perhaps symbolic of men’s extreme intolerance for small talk while they’re having a wee). This will give you one ‘strike,’ of which you have a limited number before game over. The same applies to taking too long to get somebody ‘relieved,’ which will yield you another strike and a mess on the floor. Suffice it to say, once the game has introduced you to the basics it gets very hectic very quickly. Later, special characters will appear, and have particular requirements (for rather obvious non-dangly-anatomy reasons, the rare female visitor can’t use the urinals). 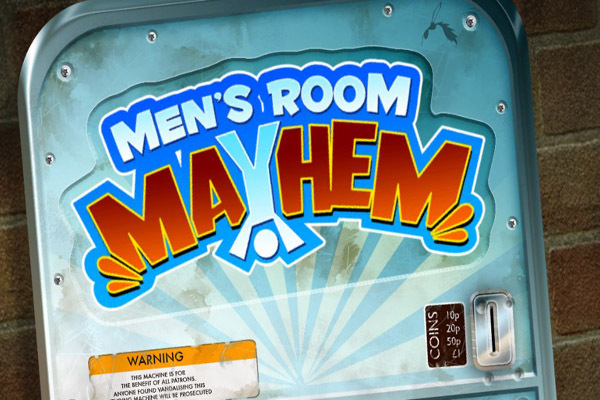 Men’s Room Mayhem is an odd little package, but one full of achievements to earn and highscores to tackle. If it strikes a chord with you, there’s a very addictive experience here.